3D Baby Casting allows you to preserve a special moment in your child's life by creating a life-sized replica of your baby's hands and feet which captures the finest detail. 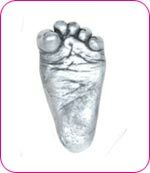 A cast of your Baby's hands and feet is the ultimate luxury Baby Keepsake or Baby Gift - a wonderful reminder of a special time gone-by, to be cherished forever. Specialist baby casting techniques will be used to capture a copy of your baby's hands and feet and reproduce them into stunning, intricate sculptures, unique to you child.